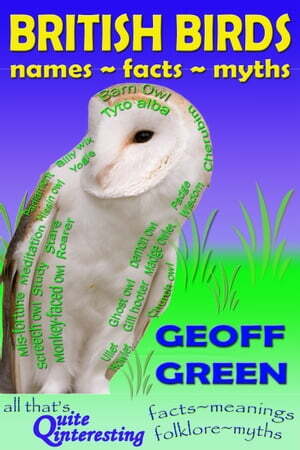 Collins Booksellers - British Birds -Names~Facts~Myths by Geoff Green, 9780993334009. Buy this book online. This book explores the intriguing world of the names of British birds. Uniquely the book examines in detail the wide range and meaning of local and common names, the derivation and meaning of the official vernacular English name and thirdly the same analysis of the birds&apos; scientific name. The derivation and meaning of a bird&apos;s name gives a fascinating insight into our long and intimate relationship with birds and how much they have been a part of our lives for millennia. The historical derivation of names is given showing how birds &apos; names reflect our relationship with and changing knowledge of birds. It also notes the way other languages have influenced names. Mis-named birds are identified showing how our increased knowledge of birds has guided us to more accurate names. Many names are linked to myths and tales, often establishing the characteristics we attribute to birds, so many of these are referred to. One key observation about birds is the way they flock. As a result humans use (and sometimes have specifically created) collective nouns for birds. These are given in the book, often providing another insight into the nature of the bird. Alongside this analysis of the names of birds, the book adds many facts and figures giving a greater insight into the bird&apos;s life. The interesting facts range from a description of their breeding behaviour, migratory feats, feeding habits, song, physiology and detail of their often extraordinary senses. Notes are given of the relative increase and decrease in bird numbers. Given our very long and intimate connection with birds, inevitably there are many myths, tales and folklore involving them. Many of these are recounted to provide a fuller picture and historical perspective, some linking to the bird&apos;s names. Included are Greek and Roman myths as well as much British folklore and superstitions, revealing many fantasies that prevailed for centuries.